Readers will be reminded of the importance and significance of life with God in Heaven. 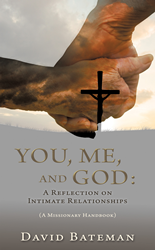 David Bateman’s book You, Me, and God: A Reflection on Intimate Relationships (A Missionary Handbook) ($13.49, paperback, 9781545639962; $6.99, e-book, 9781545639979), is available for purchase. You, Me, and God: A Reflection on Intimate Relationships (A Missionary Handbook) answers many of the questions about salvation through belief in Jesus Christ, repentance of sins and love of God and neighbor, and the way to eternal life in Heaven with God. Many youth are falling away from the Christian church at alarming rates and the trappings of society are coming into conflict with spirituality and religion. You, Me, and God helps re-focus readers’ attention back to the greater significance of eternal life. “This life is short. The life hereafter is eternal and will be spent either in Heaven or Hell. God wants each of us to spend eternity with Him in Heaven. The way to salvation is through belief in Jesus Christ, and loving God and your neighbor,” said Bateman. Dave Bateman is a retired lawyer, having served in both public and private practice for over 30 years. He is currently a coffee farmer in Kona, HI. He has been active in numerous bible study programs and has written books on spirituality, including: CHRISTIANITY ON TRIAL: A Case for Christ, GOD ARE YOU FOR REAL? THE LONG JOURNEY HOME: A Roadmap for Christians, and A GOD OF GRACE, MERCY AND LOVE: The Story of Salvation. Xulon Press, a division of Salem Media Group, is the world’s largest Christian self-publisher, with more than 12,000 titles published to date. You, Me, and God: A Reflection on Intimate Relationships (A Missionary Handbook) is available online through xulonpress.com/bookstore, amazon.com, and barnesandnoble.com.